In our picture here the pins are 1-4 at the front and 5-8 at the back. Before connecting anything it’s advisable to push a paper-clip into the hole on the battery, to cut the battery power and make sure the Management Engine isn’t sending any bothersome i2c messages which could corrupt our ROM as we write it. On pin 1 goes the white connector and cable. On pin 2 goes the black connector and cable (not the black connector with pincers). On pin 4 goes the black connector with pincers. On pin 5 goes the yellow connector with light grey cable. On pin 6 goes the green connector with lilac/purple cable. 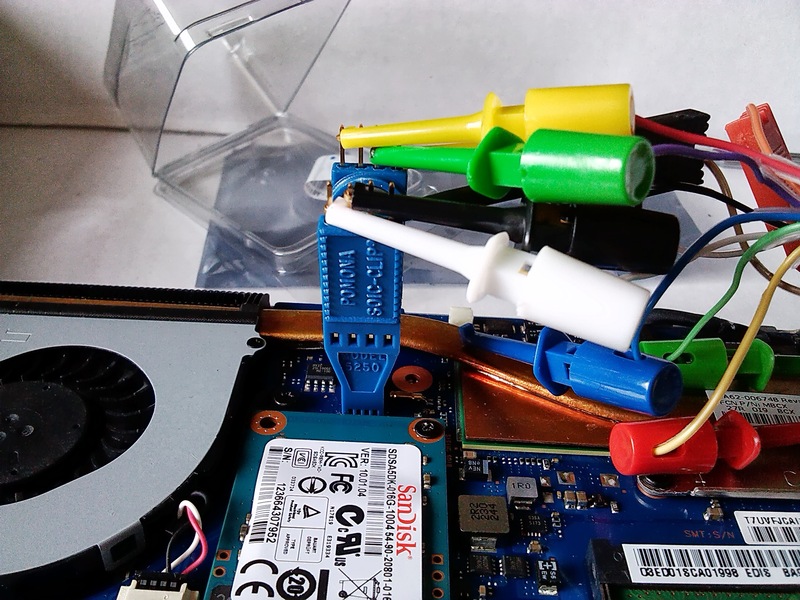 And finally, on pin 8 goes the yellow connector with red cable. The last one is the most important not to put in the wrong place as it carries 3.3v. If you add the -n option it will forgo the verification and roughly half the time of the process (it still takes at least 40 mins though). Be patient, and rejoice in your Chromebook’s resurrection! I’ve got a Chromebox that I’m interested in hacking like you’ve done here with a custom Coreboot build (basically I want to turn it into a generic Debian server and get it to boot off a 128GB mSATA SSD I couldn’t get the Chrome kernel to boot from (the install went fine). My question is, to ensure I’ve got a good flash backup, do I need to read it with the bus-pirate (to ensure I get the bits masked out by the Intel management chip), or can I just use flashrom from the running chrubuntu system I’ve got installed on there? The main thing with the backup is that you get the RO_VPD and GBB areas, since those are the bits unique to your machine. If you backup from within ChromeOS it will not backup the Management Engine, but this can reasonably easily be obtained from the shell-ball ROM. And I would recommend using the ChromeOS version of Flashrom (i.e. from within ChromeOS) to backup, not your distro version (as it has extra options and chipset support that are sometimes needed). In case anyone else reads this, you’ve bricked your Toshiba. I gave a more thorough answer on the community. Well, I have a Acer C720 and tried to flash for a dual boot ubuntu. It would seem that I bricked it. All I have is a blue led and a black screen. I have tried several different methods and combinations of wsc refresh and power , waiting a min or so then inserting the recovery SD. No luck. Which ROM did you flash, and how? I used a script @ the Kodi (xbmc) forums thats used for the chromeBOX after I read that it was successful on the C720. After further research it would appear that it is indeed bricked. So I have been kinda wanting a Rassberry PI anyway to play with. Is the B+ model sufficient to do the job? The firmware I have is a stock one. I dont thik its the orginal. I thought the script backed it up but I dont think it happened. I really dont require Chrome OS but with a non original firmware would the Chromium OS work instead if I did want to dual boot? Are you sure it’s not just the display? If you make a Fedora USB stick using the live USB creator, you can reserve some persistent storage on the drive and install/configure an SSH server. Would be a lot less fraught than debricking. As far as I know, it is, but I haven’t used one myself. I have experience with the Bus Pirate, Dediprog SF100, and BeagleBone Black in this regard. The Pi will be a touch slower than the BBB, but I don’t expect there’s a massive amount in it, and the BBB flies at flashing. I think you’ll need some female to female jumper wires to go along with your Pi and Pomona 5250 SOIC clip, but you’ll have to check that, and you’ll also have to find the correct wiring (I think the article I used for the BBB also has the Pi wiring in it, it’s on linux.com). You can use one of Arnold The Bat’s ChromiumOS builds with the custom firmware, but I’ve no experience of getting it to dual boot with Linux. Should be possible, but you’ll be a pioneer. Well I have attempted to use a USB bootable device in hopes that is was only the display. I power on the chromebook wait a second or two, press ESC and then the number 2. There is no indication the chromebook is booting from the USB device (it has a tiny led indicating disk access on the device that never lights up). The time it takes to get to the SeaBIOS menu can vary depending on the ROM. 3.5 seconds is jumping out of my mind, for some reason. Try variations before you go spending your hard-earned. Well, I bought a Raspberry Pi B+ and flashed your ROM. Worked perfect. It did seem a little slow. 7 Min to flash it. Praise Jesus and have a great day! Can i debrick my chromebox only using a RPI B+ ? if i can , just tell me how ! Yes, but you will need a Pomona 5250 SOIC clip or equivalent (don’t be tempted by the 3M one, it’s far too stiffly sprung, and the teeth don’t allow proper contact), and some female to female jumper wires. There’s an article about using one to flash an SPI on linux.com. I guess I’ll be doing this project next week ! Yes, that looks like a good guide. The Libreboot guys are pretty fastidious in their work. I was left with two options , one was getting a jumper cable and the other was to take the board to an electronic shop to do the hard lifting , and since i find myself alot in such situations , I went with the cable , It usually takes 15-50 days to receive such orders from china , I’ll update you when i debrick my brick :D lol. why do you think i got bricked ? I’m not entirely sure that it is bricked. It may just not be the display coming up, but as noted, the basis of this ROM has bricked one Stumpy, so it could well be.